Greens are very good for health,one of the best variety of spinach that is can be eaten by all the age groups in any forms they wish,It makes the body strong and healthy. It promotes child growth. The magnificent values present in this spinach cures many rare diseases. but most of us hesitate to take it as regular dish in our diet. Some tasty recipe will help us to include greens in our food. Clean and wash greens drain water completely and chop. Heat pan with one tsp of oil season with mustard seeds. Add chopped Onion and green chilli,saute well. 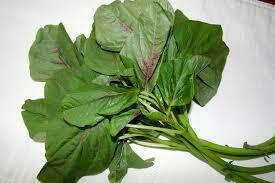 Add chopped greens to it saute for a while,when greens shrinks and becomes soft,add salt mix well and switch off. 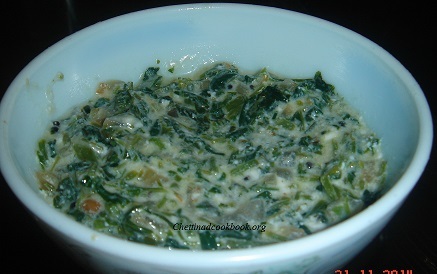 Allow it to cool, add 2 tbsp of curd in another bowl and sprinkle pepper powder whisk and add it to the prepared greens. Note If you prefer raw onion add raw onion at last no need to saute.